CB cafe racers are a dime-a-dozen these days so it’s not often that I come across one that stands out as being genuinely special but this 1992 CB750 built by IndustrialMoto is all kinds of awesome. Not only does this one-off CB feature modern components and suspension, but the cosmetic work and build quality are good enough to easily pass for a factory bike. Dubbed “Project Scorpion”, this build started its life as a 1992 CB750 NightHawk that was then completely stripped down. The engine was rebuilt and the carb was overhauled and rejetted to accommodate the new intake and exhaust systems. All of the bikes suspenders (inverted forks and monoshock) are from a K6 GSX-R600, as are the bike’s rims (wrapped in Pirelli Scorpion Trail II dualsport tires), rotors, calipers and swingarm. A custom subframe was then fabricated to house the CB’s new ribbed leather seat. All of these GSX-R parts massively improve this motorcycle’s performance, the difference between this bike and its stock counterpart would be night and day. The tank on this bike is from a 1978 CB750, creating an interesting build that blends retro and modern aesthetics. The custom paint job includes four different colors with some matte and some gloss, all covered in a flat clear-coat, ensuring the colors will last for quite a while. The headlight on this Honda is a J.W. Speaker LED headlight that retains the classic round-mono headlight found on the stock CB, but with multiple LEDs it substantially updates the bike’s look. The wiring is made up of premium parts from Motogadget, along with a wireless key system and RFID key to start the bike (see video below). 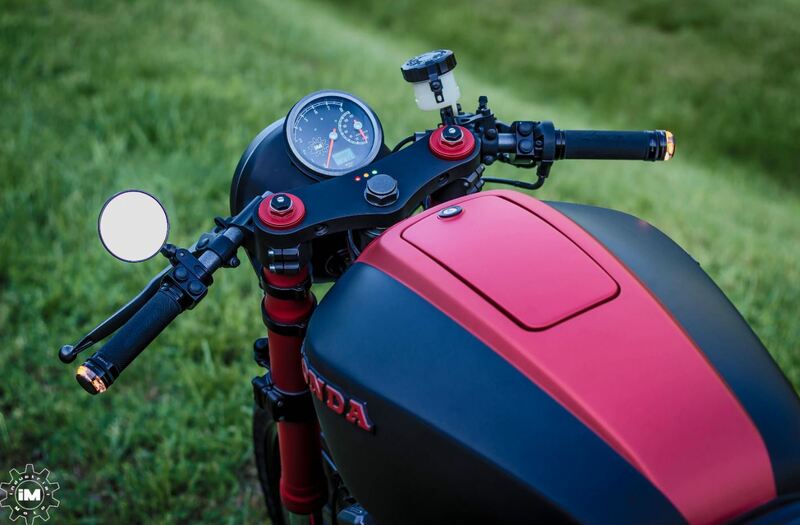 The custom tach and speedo with GPS gauge round out Project Scorpion’s trick modern portions. The rest of the nick-nacks on the bike are more subtle but still add to the character and quality of this custom CB. Giving the pilot a more aggressive seating position is a set of Woodcraft clipons and Driven grips. An LED-brake light with built in license plate light keep this CB 100% street-legal. There are also a handful of parts that were custom made just for this project such as a Hand milled aluminum air intake with a honey comb mesh cover, Triple Tree with LED indicators, Kick Stand, Custom built foot and toe pegs and a one-off exhaust with stainless steel wool packing. The folks over at IndustrialMoto really have pulled off an impressive build with this bike. The attention to detail and craftsmanship are beyond impressive and I think justify its hefty price tag. 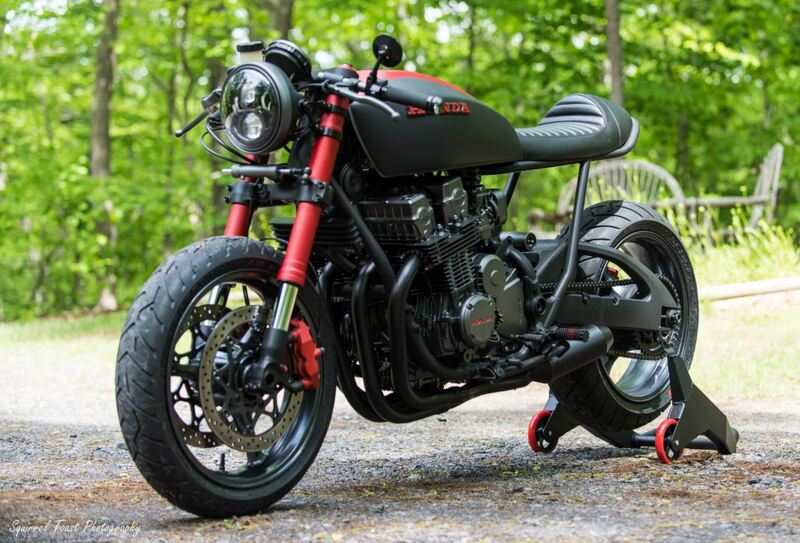 You can find this one-off 1992 CB750 cafe racer for sale in Virgina here on CafeRacerForSale with a price of $12,500.